This B&H Kit combines the Drobo 5N2 5-Bay NAS Enclosure (Platinum Edition) with five Seagate 8TB IronWolf 7200 rpm SATA III 3.5" hard drives for a total storage capacity of 40TB. The 5N2 5-Bay NAS Enclosure (Platinum Edition) from Drobo improves upon the original 5N2 by pairing it with a 128GB mSATA SSD, five years of DroboCare warranty services, and a five-year drive recovery service plan from DriveSavers. The 128GB mSATA SSD is installed into the unit's Accelerator Bay and boosts system performance by placing data that is read or written into SSD storage. When the data is active, it is stored in the SSD and will be moved back to the hard drive tier as its use decreases. Upon product registration, the extended five-year DroboCare warranty provides hardware replacement, technical support, and migration assistance. Lastly, in the event of drive failures or data loss, the five-year drive recovery service plan from DriveSavers is good for a one-time use. Drobo's 5N2 has been designed for data sharing, secure backups, remote access, and disaster recovery solutions. It is equipped with five 3.5/2.5" SATA drive bays that support SATA III (6 Gb/s) and SATA II (3 Gb/s) drives hard drives and SSDs. It distinguishes itself from the original Drobo 5N through the inclusion of an additional Gigabit Ethernet port, for a total of two. These two ports provide bonding support, also known as Adaptive Link Bonding, for link failover and aggregation without Ethernet switch support. The 5N2 also features an upgraded processor, Drobo Disaster Recovery, and an improved battery to help protect data in the memory or cache in the event of a power loss. To facilitate data protection, Drobo's Disaster Recovery allows you to set up a pair of 5N2 units to automatically make an offsite copy of your data, including user account information, helping to ensure data availability in the case of unforeseen circumstances. Additional protection is accomplished using Drobo's BeyondRAID technology, which enables single or dual-drive redundancy. If there are any empty drive bays, BeyondRAID allows additional drives to be inserted into the array, where they would be automatically configured. If all drive bays are occupied, simply replace the smallest capacity drive with a larger one and BeyondRAID will handle the rest. BeyondRAID is also what allows drives of varying capacities to work in the same unit, which helps enable future expansion as larger drives become available. In the event of a power loss, the included rechargeable battery helps protect data stored in the 5N2's memory, or cache. If there were to be a sudden power loss, the battery allows the Drobo to stay powered long enough for the cached data to be written to non-volatile storage. Cooling is provided by a fixed 120mm variable-speed fan and once installed, the hard drives can be configured to spin down when they're not in use, helping to further reduce noise and energy. Also, the LEDs can be dimmed to reduce light pollution when working in sensitive environments. The Drobo 5N2 is compatible with Windows and Mac, including APFS and macOS High Sierra. It includes two 6' Ethernet cables and a 6' power cord with a power supply that runs at 100-240 VAC ~ 2A, 50-60 Hz. Built on BeyondRAID technology with single- or dual-drive redundancy, the Drobo 5N2 helps protect data without any user interaction, even in the event of multiple drive failures. In addition, Drobo's simplicity provides a quick, seamless setup, and software configuration is not required to access storage on your network. Drives can be added or hot-swapped and updated in real time for storage expansion with zero downtime. Just add a drive in an empty bay or remove a smaller drive and replace it with a larger one, when needed. The Drobo 5N2 is equipped with dual Gigabit Ethernet ports for network connectivity and makes sharing your data easy by connecting directly to your network. These two ports provide bonding support, also known as Adaptive Link Bonding, for link failover and aggregation without Ethernet switch support. This helps increase performance and compensates for network connection problems. Usually reserved for larger enterprise-class storage solutions, the Drobo 5N2 gives you the option to implement Hot Data Caching through the Drobo Accelerator Bay and an included 128GB mSATA SSD. This feature intelligently uses high-performance flash to accelerate performance, allowing faster access to your data. Drobo has partnered with DriveSavers Data Recovery for added peace of mind in case of data loss from your hard drives. This 5-year coverage plan is good for one use and can potentially save you thousands of dollars in the case of a failed disk pack. The myDrobo platform extends the functionality of Drobo NAS devices by providing a secure and fully end-to-end encrypted path to selected Drobo apps. The iOS and Android app, DroboAccess, allows Drobo NAS owners to access their data from almost anywhere, anytime through a secure and encrypted network. This allows Drobo consumers and SMBs to set up their own private cloud storage solution with the ability to view documents from a web browser or from the DroboAccess mobile app. The DroboPix app allows owners to easily and automatically upload their photos and videos from their Android or iOS device to a network Drobo. The files are automatically uploaded over Wi-Fi and are securely backed up and protected on a Drobo. Drobo doesn't just protected you from a drive failure, but also from potential data loss after a power outage. The Drobo 5N2 includes a battery that helps protect data in the memory, or cache, that is, data on its way to the drives. When power spontaneously goes away, the battery keeps the Drobo alive long enough for the data to be written to non-volatile storage. With Drobo Disaster Recovery, you can set up a pair of 5N2 units to automatically make an offsite copy of your data. Simple to set up and manage, Drobo Disaster Recovery replicates your data to another 5N2, helping to ensure data availability in case of a disaster. Even better, the remote 5N2 stores all user account information, helping to simplify any recoveries. Drobo devices have always been space efficient and the Drobo 5N2 is no exception. It was designed to provide a high-storage capacity without taking up a lot of desk space. It is compact because of Drobo's carrier-less drive bay design, allowing drives to be installed very close to each other. The 5N2 is also quiet due to its fixed, tuned, and large 120mm variable-speed cooling fan. 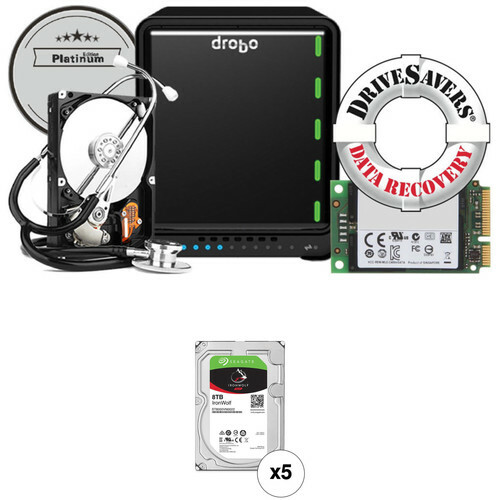 Drobo offers dozens of popular applications that extend the capabilities of the Drobo 5N2. Whether you want to stream media or backup to the cloud, DroboApps have you covered. Popular apps include ElephantDrive for cloud backup and Plex for media serving. Seamless integration with the Drobo Dashboard makes using DroboApps user-friendly. The Drobo Dashboard is a single tool used to centrally manage all of your Drobo devices. The Drobo Dashboard displays status as if all of your Drobos were right in front of you with the same status lights and capacity gauge that are on the front panel. All administration tasks are a single click away. Box Dimensions (LxWxH) 13.9 x 13.0 x 10.4"